Introduction Wow, 25 issues! I'm surprised, but suppose that's to be expected when I'm not even sure why I publish Leeking Ink. I really don't have a clear idea. All I know is that I've developed a rather nasty writing habit in the last seven years and since I'm not about to 12-step it I have no choice but to publish. Accompanying this issue should be a mini comic by Androo Robinson. A couple a years ago I tried to organize a Chick Track-TR Miller zine tribute zine. Androo was the only person who came through and submitted something. I thought I would include his drawings with this issue. If you have no idea what a Chick Tract is or who TR Miller is...well, the humor will be lost, sorry. I also recently wrote an article regarding some of my experiences with commercial photography for Clamor Magazine. It should appear in the Jan/Feb 2002 issue (www.clamormagazine.org; PO Box 1225, Bowling Green, OH 43402). I took the photo on the cover one evening last summer in Wildwood, NJ. 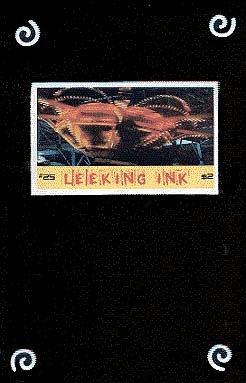 You'll find more photographs and artwork of mine on the Leeking Inc. website under the portfolio section. Also, Androo has a new comic, Cryptozoa, available online. Due to the time-delay involved with print, some columns for Xerography Debt will appear on the website prior to publication, so check out that section too. I have a few acknowledgements this time. Thanks to Patrick for listening, advising, and knowing exactly the right things to say and do. Thanks to Jan and Earl for their support (and for the scanner!). Thanks to Jeannie, Androo, Cali, Tracy, and Dave you all know what you did, or should. I'd also like to thank the Republican Party and the idiot puppet in charge for creating the highest unemployment rates in 20 years. If it weren't for you guys I might never have found the time to finish this issue! We had fresh basil growing right outside the kitchen door, so I made this fast and easy meal frequently during the summer. The ingredients are flexible to personal tastes, and the walnuts, roasted red peppers, and hot sandwich peppers can all be omitted or substituted. Marinated artichoke hearts taste great too. The recipe should feed about 4-6 people. All measurements are estimates, as I cook by sight and instinct instead of measuring things like I should. Blend basil, garlic, pepper, salt, roasted red peppers, sandwich peppers, olive oil, and vinegar in a food processor while the pasta boils. Drain pasta and combine the pesto concoction and hot pasta in a bowl. If the pasta seems dry add a bit more olive oil until the pesto is spread throughout the pasta. Serve. It is also good cold or as leftovers for lunch the next day. Blend the chosen ingredients in a food processor until smooth. Often you can spoon the mixture back into the artichoke jar if you didnt go overboard with additional ingredients. Use as a spread on bread or crackers, with pasta, or to perk up a jar of pre-made sauce.